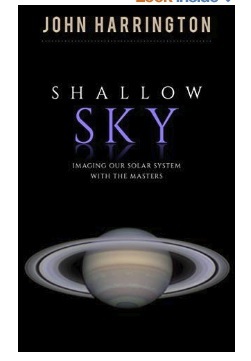 Photographer John Harrington has just published a new eBook on Amazon - "Shallow Sky". It contains very readable mini-biographies of some of the world's top hi-resolution imagers, ranging from Don Parker to Alan Friedman with a whole bunch of well-known names in between. These are men (all men, alas) many of us know personally, or at least via social media interaction. And they truly are at the top of their game. When you read the eBook, you also appreciate WHY it's an eBook - color rendition of the images is excellent AND you can zoom in to your heart's content. Something in this for everyone interested in the skills of the top amateurs, their personalities, how they became interested and what lessons they've learned along the way. Cannot recommend this enough - my only complaint is "too short!". I would have included a few more people, as the overall publication would only make a very slim paperback if published in hardcopy. Excellent value, though. $10 US, seven pounds UK. Edited by RedLionNJ, 12 January 2019 - 01:21 PM.